The Washington Series 1400 “Shorty” Control Head has become our most popular design and offers the same durability and dependability as the 1300 series, with one considerable advantage, a much lower profile. 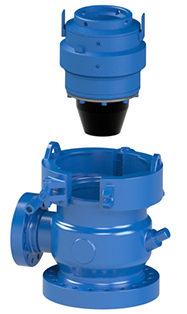 The 1400 Series can be used with or without Drive Bushings and because it is so compact has become a very versatile Rotating Control Head. The 1400 Series Control Head utilizes our 4010 Stripper Rubbers and will seal off all drill steel from 2″-8″ OD.